Virology is the scientific discipline concerned with the study of the microbiological or pathological science which involves the study of viruses and viral diseases, including the distribution, biochemistry, disease producing properties, physiology, molecular biology, ecology, cultivation, evolution, genetics and clinical aspects of viruses. Virology explain about the interaction with host organism physiology and immunity, the diseases they cause, the techniques to isolate and culture them, ways to infect and exploit host cells for reproduction, and their use in research and therapy. Notable advances in nanotechnology, nanostructure-based electrical sensors have been emerged as promising platforms for real-time, sensitive detection of numerous bioanalytes. Using Nanopore-Based Resistive-Pulse Sensing Techniques, scientists are determining both the dimensions and the number of viruses. So, this provides important complementary information and detect all viruses and virus related particles. Microbiology testing considered as one of the most rapidly growing segments in the diagnostics industry. The major driving forces for this include continuous spread of HIV, which is the world's major health threat and is a key factor contributing to the rise in opportunistic infections, bioterrorism, advances in molecular diagnostic technologies, and a wider availability of immune suppressive drug. Awareness programs about various viruses such as Ebola virus, Flu, Zika virus, STD’s, AIDS are the key factor increasing people awareness and eventually increasing the market growth by employing the virology applications. 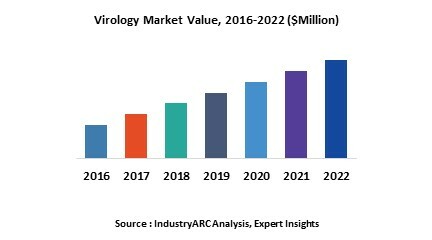 Who are the Major Players in virology market? The companies referred in the market research report includes GlaxoSmithKline plc, Abbott Laboratories, Boehringer Ingelheim Corporation, Merck and Co. Inc., Novartis International AG. 15.5. Merck and Co. Inc.